She inserted the key; the plane gave a small lurch as the engine burst to life beneath Sara’s feet, and the propeller began to spin. This engine was nothing like the smooth start of a car; it ignited with a roar, like a motorcycle gunning to maximum velocity, and within moments that sound was pierced with sharp, rhythmic bursts from the propeller’s increasing oscillation. The sound was cacophonous; Sara put her hands to her ears, to block out a fraction of the din. Sara smiled faintly at her pilot. Moira’s combination of aviation jargon and casual slang was, admittedly, really endearing. So was the way her eyes widened as she scanned the blinking lights and bright monitors in front of her, grinning gleefully, looking simultaneously mischievous and reverent. Sara put on her headphones; the cacophony was quelled into the distance, now just a background ambiance. In the forefront now was Moira’s voice, smooth and sanguine, every word spoken directly in Sara’s ears. Sara fidgeted with the boom mic on her headphones. “That’s a lot of things to know about,” she whispered into it. Sara hadn’t known what it was like to lose the ground beneath her until this moment, when Lamassu’s nose flicked up and an anchor tied around her feet her whole life came undone, evaporated, dissipated into the afternoon sunlight—she realized it existed only when it ceased to exist. Suddenly there was space around her in every direction; she was now bound by nothing. The seat belt wrapped snug around her waist, the windshield ahead, the pane of glass a few inches from her right cheek—they seemed trivial, insignificant, incapable of truly binding her when the space beneath her feet was exponentially expanding. Soon the white lines beneath them vanished as well, as the runway shrank down, becoming a tiny part of a tiny complex that was quickly passing beneath and behind, no longer required, no longer relevant. She needed nothing in the air, only that constant whir of propeller oscillation, the humming of the engine, and the whipping of wind through the microscopic crack between the window and the fuselage. She almost thought she might float above her own seat, no longer subject to earth’s gravitational force. Even Moira’s voice was distant now. Even the trees were shrinking away now, becoming indistinct clusters of viridian mixed with a soft palette of mossy and earthy hues, separated by strips of gray asphalt drawing mechanical grids along the earth. She looked ahead, and for the first time took in the sky; its cerulean blue spread out infinitely across the horizon, accented with a few wispy cirrus clouds and an occasional burst of gold light reflecting from nearby lakes. “Perfect.” Moira pressed a few more buttons, and the plane gently pitched forward, sliding into a consistent altitude. Within a few minutes they leveled off, thousands of feet above the earth, the bustling metropolis a mere memory behind them. Samantha Kate works as a paralibrarian (that’s library support staff) for her day job. In her free time, she tries to pursue more creative projects than is humanly possible. 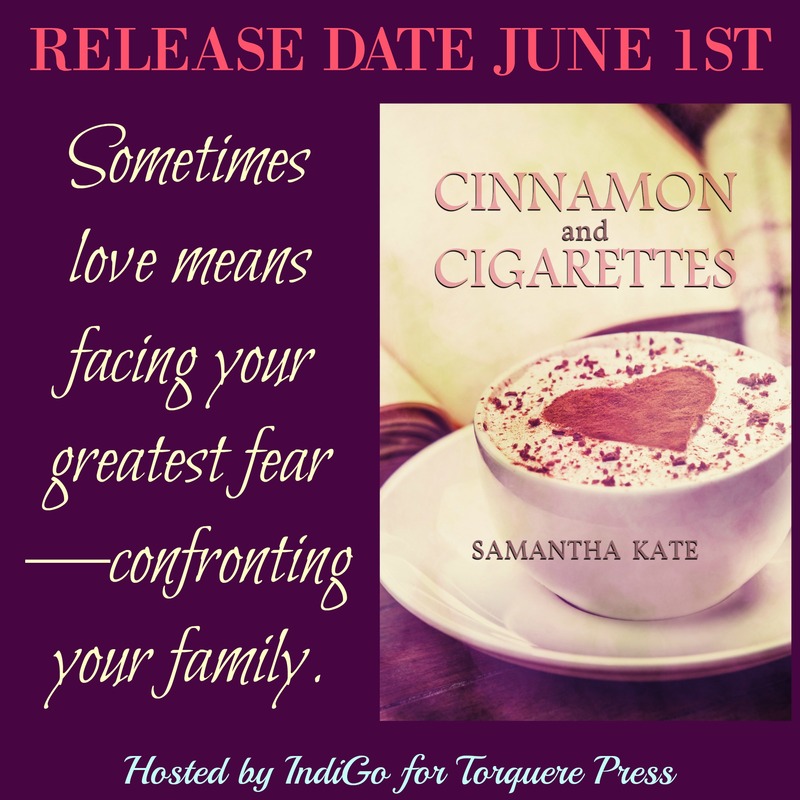 Cinnamon and Cigarettes is her first novel; her short story, “Bottom of the River,” was published in Torquere Press’ Twisted Fables anthology in February 2016. 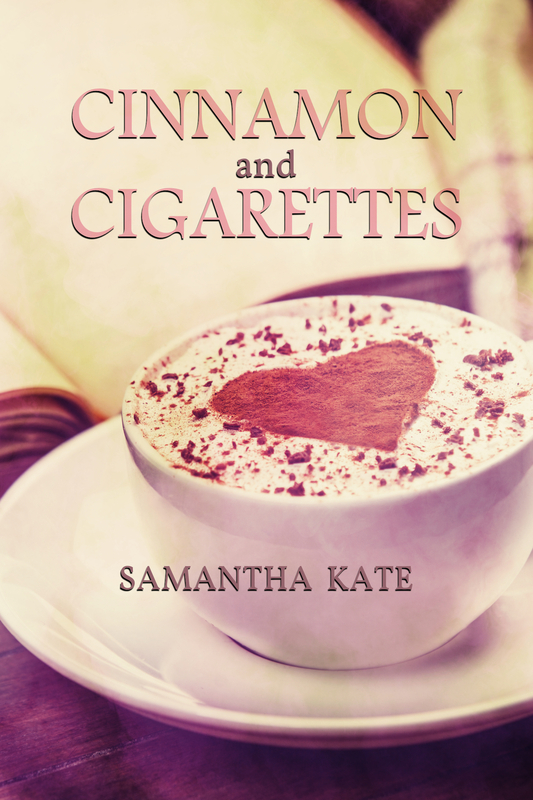 Rafflecopter Prize: One winner will be selected to win an eBook copy of Cinnamon and Cigarettes.